Remember the "Good Old Days"? — Word-Strong Remember the "Good Old Days"? Remember the "Good Old Days"? Most all of us have selective memory. Some people look back to an earlier time of life and yearn for the "good old days." Others get fixated on missed opportunities or tragic events. Selective memory skews our perspective. We either filter out unpleasant experiences or dwell on them. Either way, we're not seeing things accurately, and this impairs our judgment and impacts our emotions and thinking. Sometimes we need to reflect on some of the not-so-good experiences in life, so we have a more sober view of life. On the other hand, we need to let go of some things and leave them behind us. What are the things deemed "better" than their counterparts? How could sorrow be better than laughter, or going to a funeral rather than a banquet? Why would it be better to hear a wise reprimand than to hear someone praise us? What things said in these verses indicate selective memory? The death of someone we know should cause us to pause and take stock of our own life. Why? Death has a way of reminding us how fragile life is, and how temporary it is. When someone passes from this life, it's too late to tell them something you wish you'd told them earlier. Things like pride, regret, unforgiveness, and bitterness are not worth holding onto. These things eat at and destroy us from the inside. Nostalgia tends to delude us. It's like summing up a person's life by their birth and death dates. Their life is the dash in-between the dates. It's fine to remember the highlights of our life, but remember what takes place in-between the highlights. Those are when character is formed, and this makes the highlights more valuable. Do you allow yourself time to reflect on what and who are important to your life? Do you have people in your life who will be honest with you, and even rebuke when needed? What do you have a hard time letting go of? Do these things dominate your thinking? 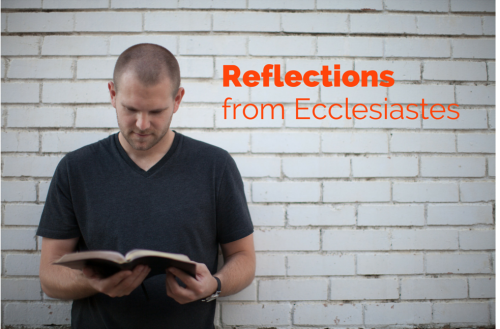 How can a person keep a good perspective in life, rather than fall into nostalgia or regret? Older PostWhy Do We Bother?